WILLCOR uses a rigorous process-based approach to program management support. Our knowledge process is based on the concepts of: Identify, Analyze, and Effect Change. Identify: Seek out issues by a thorough review of contract and programmatic documents, relevant specifications (MIL, IPC, JDEC, etc. ), business processes, and site visits / manufacturing reviews. Analyze: The data / observations are compared to requirements, root and contributing causes identified, and develop actionable recommendations. Effect Change: WILLCOR works with the program to revise contract language (CDRLs, SOW, etc. ), train new processes, and track with the contractor / performer to verify that the recommended practices are enacted. 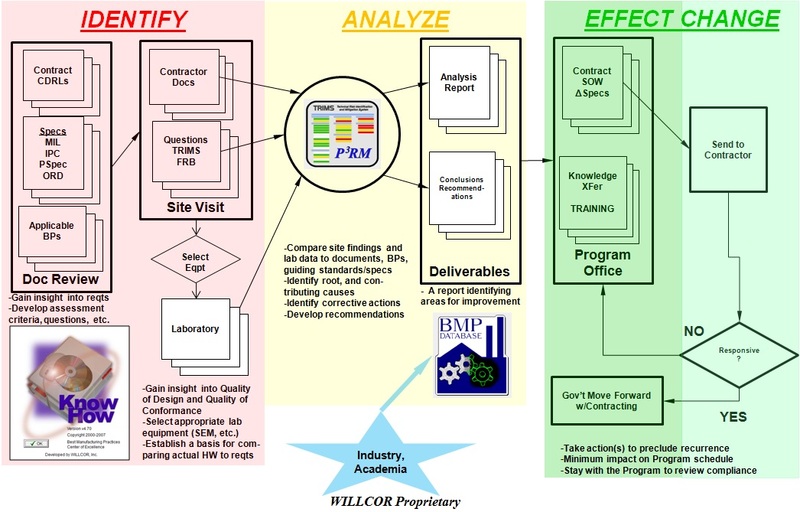 The framework of the WILLCOR knowledge process is based on utilization and exploitation of KnowHow, TRIMS, and the BMP database, collectively known as the Program Manager's WorkStation (PMWS). WILLCOR engineers tailor the process to each unique customer engagement.